STORY: England skipper Eoin Morgan on Tuesday (July 03) said his men were completely deceived by left-arm wrist-spinner Kuldeep Yadav as the hosts were undone by Indian spin bowlers. Yadav took five wickets, including three in one over, as England struggled to a modest 159-8 from their 20 overs. 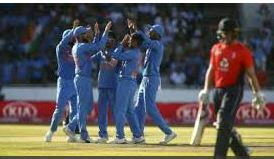 In reply, Indian opener Lokesh Rahul made a brilliant unbeaten 101 to lead his side to a crushing eight-wicket victory over the hosts in the first Twenty20 international at Old Trafford. Morgan vowed his team would put up a much better performance against India’s slow bowlers in the next match. The second game is in Cardiff on Friday (July 06).